Most effective spoon lure on the world! Grba is suitable for almost all types of fish, from trout, chub, asp, pike catfish, perch... The only thing you need is a right size spoon and a new, unforgettable fishing adventure is at your disposal. No matter whether you fish on streams, in the depths of the Danube, on a lake or perhaps a pond, "Grba" is the right choice, being a lure that has been a classic for a long time, as far as fishing is concerned. Spinner Round is producing in four different sizes (weights) and huge range of modern design colors. We use several types of foils, such as special 3D mosaic stickers and labels with special colors, which are the most attractive for fishing. The quality of the final treatment is on the highest level. Spinner Long is producing in five different sizes (weights) and few modern design of colors. We use the Special 3d mosaic metal foils in few most attractive colors for fishing. The quality of the final treatment is on the highest level. We are presenting you different models,colors and sizes of our products developed by Orka company. We are offering you lures of wide application and lures specially designed for specific type of predator fish,different type of shapes,colors and sizes combined with different type of vibrations,from high frequent vibrations to low frequency vibrations,different types of tail actions,lures designed for impassable river or lake bottoms,lures designed for blurry or clear water and much more...Choose Your lure,and give yourself the fishing of a lifetime! We were on really nice trip to the Amazon, Brazil. 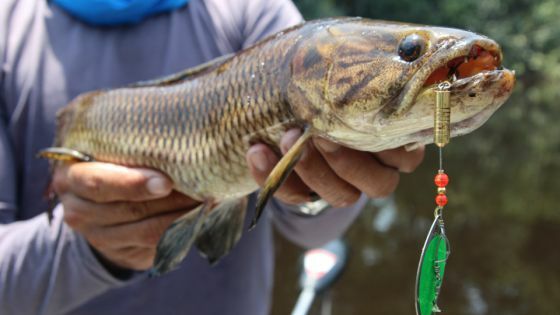 Amazon has a wonderful wild nature with many fish species and other kind of animals. It was a little bit dangerous but it worth. We had a great weather and river conditions, and also caught much fish and several trophies. Luckily we could caught some heavy piranhas and trairas(dogfish) on GRBA spoons and new spinners too. We use this occasion to show you some beautiful pictures from Amazon. We tried to surprise you with a new range of products from our collection. From DIKOM are coming new spinner lures come in two editions ''SPINNER ROUND'' and ''SPINNER LONG'' in several different weights and sizes, and a variety of modern and interesting designs. We got nice greetings from our friend, Mr. Miguel Sanz, and we are using this occasion to thank him a lot. We were testing our GRBA spoons for brown and sea trout fishing. One more time our famous GRBA proved that is one of the best spoon lure ever. 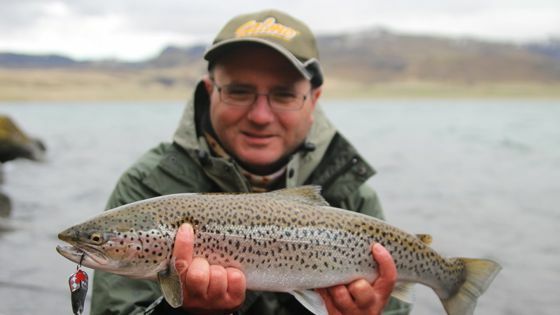 For brown trout we used GRBA#5(22g), while for sea trout we used GRBA#3(11g). Bouth catches were about 2kg. What to say, that GRBA is conquering the world! We do our best to visually present famous GRBA movement. For this occasions we use water tunnel device with constant flow and speed, and try to be much closer as we can to the real fishing conditions. With pleasure and satisfaction, we wish to show and convey the great GRBA motion to our friends and business associates. Enjoy!!! "Dikom" Ltd is a company founded in 2001. Production of sport fishing equipment has been our business activity since 2011. The main feature in our product palette is famous spoon Grba, a brand well known by fishermen. What sets us apart and recommends us as partners is production of unique lures made of top quality materials, quality final machining, modern design and product packaging. Our lures feature deadly vibration, while their effectiveness has been proved to a great extent. Our expert team makes sure the quality of our products is consistent and always of the same level. Our commitment is to make fishermen satisfied with our product and enable them to have more exciting and successful fishing. Copyright © 2019 Dikom d.o.o.